The forum July 17 is a follow up to last year’s “Heroin in Hudson: A Community Crisis”, at First Presbyterian Church. The purpose of the first forum in 2013 was to raise awareness of the problem of heroin use in the community, a drug that has caused close to a dozen deaths by overdose in the area in recent years and has led to the addiction of countless others. Topics will include recent changes in state law specific to heroin and opiate painkiller use and abuse, the reinstatement of a drug prosecutor in St. Croix County, initiatives for education and prevention in the Hudson School District, the opiate painkiller monitoring program by Hudson Physicians, a presentation by law enforcement on the current heroin problem in Hudson and an update from a mother who lost her daughter to addiction a year ago. 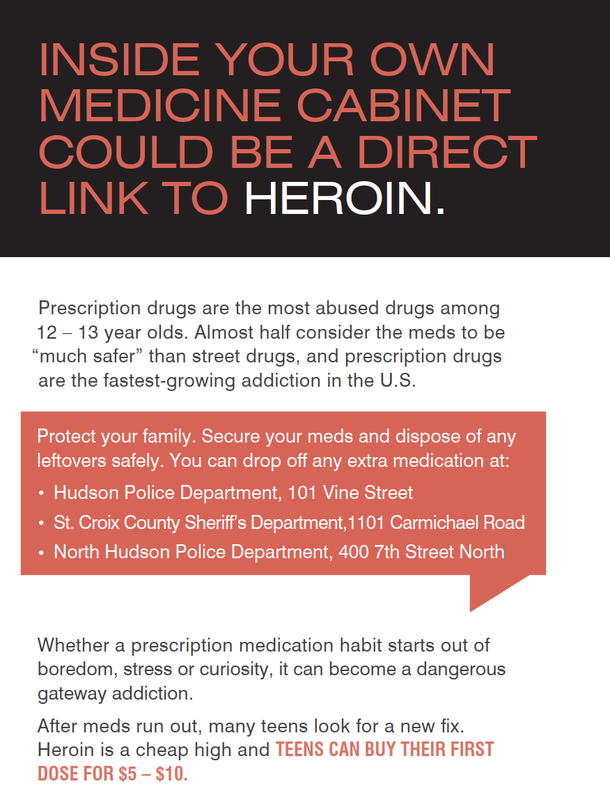 Please continue to support this issue by sharing information and keep awareness high both in teens and households that may contain prescription medications. Turning in unused prescriptions is a major effort to reduce abuse in our community. This entry was posted in Community Forum. Bookmark the permalink.